Research supports what I've been saying for years—Beta-Alanine offers a host of benefits that promote better performance and results. Those of you using Pre JYM and Post JYM consistently have likely noticed significant gains in muscle power, strength, and endurance. This is especially true later in your workouts when you are normally feeling the fatigue and hitting the wall. With Pre and Post JYM, you are able to keep that power, strength, and endurance going and going. One of the active ingredients in both of these products, beta-alanine, is responsible for a good deal of these gains. Beta-alanine is an amino acid that for many years now I’ve recommended supplementing with to increase muscle strength and power, as well as muscle endurance, not to mention greater muscle growth and even enhanced fat loss. Over the years the research has been building up in favor of beta-alanine. One such study shows that beta-alanine helps to build muscle and improve performance. Researchers from Adams State College (Alamosa, Colorado) had 22 collegiate wrestlers involved in early season training and 15 collegiate football players involved in in-season training, supplement with 4 grams of beta-alanine per day for eight weeks or a placebo for the same time frame. They measured the athletes' 300-yard shuttle time, 90-degree flexed-arm hang time, and body composition before and after the eight week trial. They reported in a 2011 issue of the Journal of Strength and Conditioning Research that the beta-alanine group decreased their 300-yard shuttle time by about one full second more than the placebo group and increased their hang time by almost 3 full seconds. In the wrestlers, although both groups lost body weight and body fat due to the fact that were trying to make weight classes, the wrestlers taking the beta alanine gained over one pound of muscle, while the placebo group lost one pound of muscle. In the football players, who were trying to gain weight, those taking beta-alanine increased muscle mass by over two pounds, while those taking the placebo only gained 1 pound. The placebo group also gained about 1% body fat, while the beta-alanine group added no body fat and just muscle. But there’s more—with the research on this specialized amino acid mounting, another study shows true benefits in soldiers. University of Central Florida researchers, along with the Israeli Defense Force, Medical Corps, had 20 male soldiers from an elite combat unit of the Israeli Defense Force take either beta-alanine or a placebo for four weeks while undergoing advanced military training. In a 2014 issue of the Journal of the International Society of Sports Nutrition, they reported that the soldiers taking the beta-alanine had significantly greater jumping power following a 4 km run and even had an improvement in their rifle marksmanship. It should come to no surprise to you that the soldiers supplementing with beta-alanine had greater explosive power after a fatiguing 4 km run compared to the soldiers taking the placebo. I have covered numerous studies showing greater power development, particularly later on during exercise, with beta-alanine. 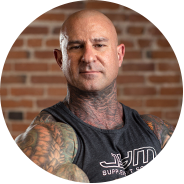 Plus, those of you taking Pre JYM and Post JYM are likely used to feeling that greater explosive power, which translates into greater strength, late in your workouts when you usually would be weak and tired. What may be surprising to you is that beta-alanine helped improve marksmanship. This suggests that beta-alanine may improve psychomotor performance, which is actually not all that surprising. After all, beta-alanine is now recognized as a neurotransmitter. That means it strengthens nerve cell signaling, which can help to improve focus and concentration. That can certainly impact the accuracy of a soldier shooting a rifle. One final study proves that when it comes to boosting performance, beta-alanine is a must-have. If you're a fighter, whether that be a boxer, martial artist, or MMA fighter, you will definitely want to add beta-alanine to your supplement list ASAP according to a new study from the UK. Researchers from Glyndwr University (Wrexham, Wales) had amateur boxers supplement with 1.5 grams of beta-alanine taken four times a day (for a total of 6 grams per day) or a placebo for four weeks. They had them perform three 3-minute simulated rounds on a punching bag. During the first 2 minutes and 50 seconds they performed standardized punching. During the last 10 seconds of each simulated round they had them do maximum all-out punching where they punched as hard and as fast as they could. They tested their punching force and punching rate during these final 10 seconds of each round at the start of the study and at the end after four weeks of supplementation. They reported in an October 2012 issue of the International Journal of Sports Nutrition and Exercise Metabolism that the boxers taking the beta-alanine had significantly greater punching force and punching frequency than the boxers taking the placebo. They concluded that beta-alanine does improve punching performance and that this may not only work in boxers but also other combat-related athletes. If you are a fighter, do not hesitate to start supplementing with beta-alanine. It can make a significant impact on your punching power, as well as your ability to maintain punching speed, especially later in the round. Obviously, when it comes to beta-alanine the benefits are too good to miss out on. So be sure you're getting 2 grams of beta-alanine from Pre JYM before every workout and another 2 grams of beta-alanine from Post JYM after every workout. Workouts can include weight lifting, cardio (or a combo of both) or sports practices and games. Kern, B. D. and Robinson, T. L. Effects of beta-alanine supplementation on performance and body composition in collegiate wrestlers and football players. Journal of Strength and Conditioning Research 25(7):1804-1815, 2011. Hoffman, J. R., et al. β-alanine supplementation improves tactical performance but not cognitive function in combat soldiers. J Int Soc Sports Nutr. 10;11(1):15, 2014. Donovan, T., et al. β-alanine Improves Punch Force and Frequency in Amateur Boxers During a Simulated Contest. Int J Sport Nutr Exerc Metab. 2012 Oct;22(5):331-7.